...it wasn't long before she found herself behind the walls of the animal shelter. Polar seemed to attract trouble where ever she went, if she didn't like her musher she would refuse to take commands, if her running partner looked at her sideways she would not hesitate to put them in their place which, more often than not, would lead to a fight that would affect the synchronicity of the entire team. Finding the right home for a dog with Polar's personality quirks can be quite tough. And if her troublesome personality wasn't enough, she would insist on adding even more difficulty to the situation by having the final say on which home was truly right for her. If the placement was not a match in her eyes she would find ways to turn herself loose and run the roads in desperation to make it back to the dog yard, lifestyle and the people she connected with most. It was inevitable that this runaway girl would soon get herself into big trouble and it wasn't long before she found herself behind the walls of the animal shelter. Due to her unique ability to turn heads in the community she was quickly recognized by others, one of who was a member of a local rescue group who sympathized with her case. Once the identification was confirmed she was quickly brought into foster care where the effort continued once again to find a permanent placement that Polar could finally accept. 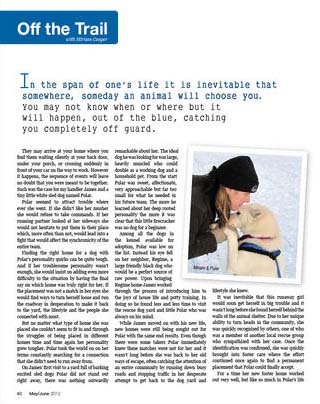 For a time her new foster home worked out very well, but like so much in Polar's life, circumstances were bound to change and soon she found herself without a home once more. When a new foster home within the rescue group was hard to find, a call was made to us at the Sanctuary where we just happened to have two openings available, one for her and one for her foster buddy Coyote. It was sound thinking that with two rescue groups advocating the placement of these huskies that an adoption was soon to come. Before long we received a call from a family looking to adopt a small pet dog who they could take out on walks and keep inside. Since Polar was so small this seemed like an ideal home to try, and since her personality was questionable in the team, house life as an only dog might prove to be a better match than the stress of working the gang-line. At first the match seemed a perfect fit and after a few weeks we received a report that she was settling in nicely enjoying a quiet corner of the house snuggled up next to the heater. Upon hearing this we knew she must have settled in well and moved our attention to the others in our care still looking for their forever homes. But in her new surroundings Polar had plenty of time to think about house life, the packed snow still on the ground, the trails yet to be traveled and the adventures yet to come. Her mind became restless once again. As soon as she saw the opportunity she was off looking for that elusive dog yard, longing for that place she could call home. After a few hours of searching by the rescue groups and the new owner she was eventually found wandering the streets, none the worse for wear and brought back to us here at the Sanctuary. Much thought was again focused on Polar and what her future would require. 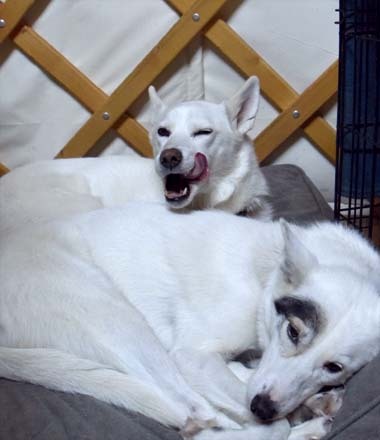 It was clear that house life was not for her so it was back to the drawing board to find that perfect kennel with the perfect musher willing to put up with her difficult personality. While we waited for the right home we worked Polar into our team and found that she excelled at leadership. She was still impatient when things would not go her way and we always had to pair her up with a dog who was patient enough not to fight, even when Polar was the one to start it. Over time she settled into our routines and with patience and training ever so slowly we saw many of her frustrating behaviors fall to the wayside. One of our main rescue philosophies is to make finding homes for our foster dogs top priority and using permanent adoption into the Sanctuary as a last resort. This way we can continue to be a rescue organization with open spaces for those in need rather than a kennel full of rescue dogs with no room to help next generations. Even though we were growing very attached to Polar we had to stick with our original plan of adoption but as we thought it through we realized that we were too far attached to let her go and try again with the possibility of failure. We just couldn't do that to our little Polar, she had been through too much and was doing far too well to take on another risk that would possibly lead her loose again out on a busy roadway. 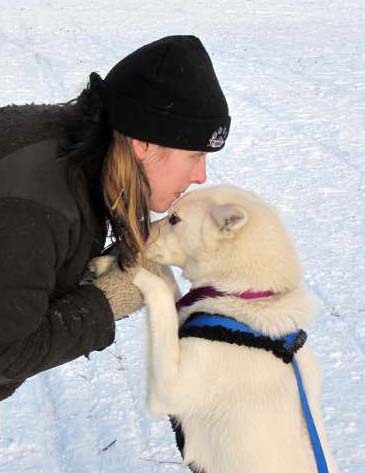 It was agreed that Polar would continue to stay with us and help our visitors learn to mush by leading a second team behind the first, and if she continued to do well, she would be allowed to take a new musher out all on her own. At every request Polar came through and became such a great model of good behavior that we would often forget about her troubled history and past frustration with other dogs. Meeting Polar today you would never know she had any worries or troubles, but Polar remembers, and we think that is why she loves it here so much. She finally found a home she feels is a perfect fit.